This is a very interesting book discussing a phenomenon which is both intriguing and most worthy of scientific investigation. 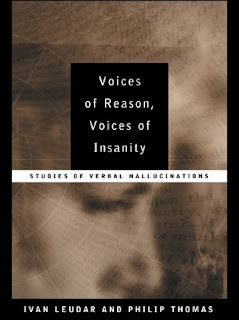 Both the serious treatment of verbal hallucinations and the perspective by which they are examined here are new… the book highlights the intellectual fascination presented by verbal hallucinations and places this phenomenon in a novel, and most welcome, perspective. The majority of people who hear voices nowadays are under psychiatric care and on neuroleptic medication. Their experiences have been interpreted within a medical framework which regards voices as a symptom of serious mental illness. This framework precludes any exploration of the content of voices, other than that which the psychiatrist considers necessary to establish those features which she regards as important in establishing a diagnosis. Psychiatrists are only interested in the small number of limited features of voices necessary to make a diagnosis. Some types of voices form part of the group of first-rank symptoms (FRS) described by Schneider (1957). Schneider thought that the presence of one or more of these symptoms, in the absence of organic brain disease, indicated a diagnosis of schizophrenia. FRS include three types of auditory hallucinations: hearing voices speaking your thoughts out loud; hearing two or more voices arguing or having a discussion about you in the third person; hearing one or more voice carrying on a running commentary about your thoughts or actions.